Kill Bill is the ultimate revenge movie by master scribe and director Quentin Tarentino that is easily one of his best pieces of work. The story revolves around "The Bride" who is played by the talented Uma Thurma, an assassin who has been in a coma for several years. Unfortunately for "The Bride" her ex-partner and boss (David Carradine) called "Bill" was responsible for her failed execution and now she must put together her fragmented life... one step at a time. One by one, The Bride begins her hunt for those responsible in this classic Quentin Tarantino film which pays homage to a variety of genres from the 60's and 70's that features action, drama and a healthy dose of over the top violence and humour. With a star studded cast of stars that include Lucy Liu, Vivica A. Fox, Daryl Hannah as the one-eyed blonde assassin and Michael Madsen, the actors truly lend themselves to this movie with some exceptional performances. The scenes which involve Lucy Lui as O-Ren Ishii are thoroughly entertaining, especially the origin story of O-Ren Ishii which uses Japanese "anime" animation. It's difficult not to appreciate the irony of the characters and match that with some over the top action scenes and this is truly the modern Girl Power movie, even though the movie is clearly aimed at the male audience. 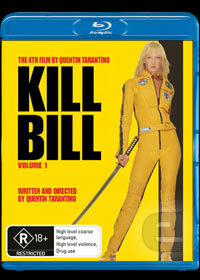 Fortunately for fans of the franchise, Walt Disney Studios have released the definitive version of Kill Blu on Blu-Ray which contains exceptional video and audio quality. Match that with some engaging special features that include the Making of Kill Bill, the Musical Performances by the "5,6,7,8's" and some Tarantino trailers and this nicely rounds out this almost perfect Blu-Ray.